They say there's a first time for everything and last night saw me experiencing another first; my first ever L'Oreal Paris Runway event! I was filled with so much excitement, as I made my way into Central Pier, Docklands, care of my chauffeur, aka husband. Cuddling up to the cutest Dulux dog I have ever met, was such a sweet way of starting off a night which was going to be filled with many magical moments. I had the pleasure of attending the L'Oreal Melbourne Fashion Festival, Paris Runway 7, presented by Frankie Magazine. 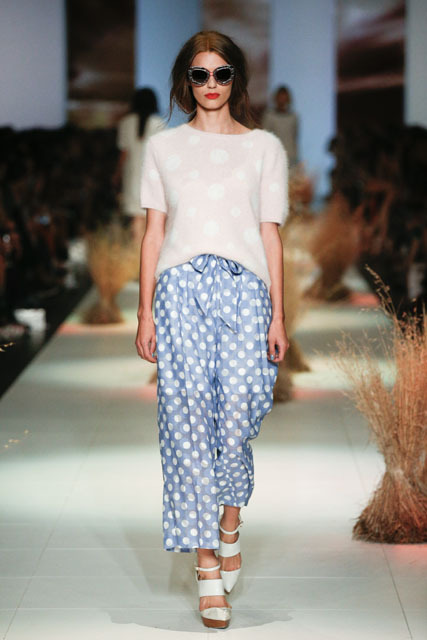 On the runway, the following Australian and New Zealand designers showcased their new Autumn/Winter collections for 2013: Gorman, Kuwaii, Leonard St, Limedrop, Secret South, and my two absolute favourites, Karen Walker and Jolet. Much to my sheer delight, Karen Walker started off the show. I've always been a huge fan of hers, much more so recently. My favourite looks from the Fantastique Magnifique collection were the knits, in the prettiest pastel colours with the cutest of spots. Who can forget that pink A-line coat. LOVE!! I have huge cravings now! Another highlight from the night was the Autumn/Winter 2013 collection by Melbourne-based designer, Jolet. My favourites were the "Tokyo Lights" printed sheer blouses and dresses. I'm really fond of Jolet's digital prints and love how she's evokes different moods and stories. I enjoyed every moment, from meeting the team who made my media accreditation possible, AMPR, to being treated like a VIP, meeting up with my fashion blogger friends, designers and fashionistas. I simply did not want the night to end, but with everything in life, good things must come to an end. I cannot wait to do it all again! Special thanks to the wonderful team at AMPR, in particular Kelly Tanti. I welcome the opportunity to work with you again in the near future to support this fabulous event that is the L'Oreal Melbourne Fashion Festival. Don't forget to subscribe to my blog by email, Blogger or Bloglovin'. I'm also on Twitter (my handle is @SuziMaynard), Instagram and Facebook (Suzi Maynard). So, what are you waiting for? Come follow me! you looked so demure in that LBD! Wasn't Violet the Dulux canine mascot divine? Thanks Cecylia! I was actually wearing a sweater and skirt. Would have looked like an LBD in the dark though! Yes, I loved Violet. She's a real sweetie. Thanks GG! Great to hear from you again.